J. K.-Trans Freight forwarding, transport international, Józef Kucharczyk | Domestic and international transport. The scope of our services includes transport of neutral goods, wastes and hazardous materials subject to the provisions of the ADR convention. The road transport sector is steadily growing as it is the most accessible form of freight transport both at home and abroad. Are you looking for a suitable freight carrier that quickly and safely delivers your cargo to the designated address? Choose J. K.-Trans! We are on the market since 1993. 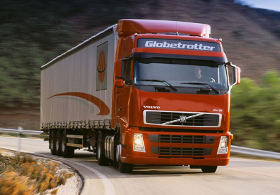 The primary activity of our company is international and domestic road transport and freight forwarding services. We operate throughout the European Union. The scope of our services includes transport of neutral goods, wastes and hazardous materials subject to the provisions of the ADR convention. We have all necessary licenses and permits allowing us to move freely within all EU countries. We have a modern fleet of tractor heads + tilt semi-trailers with a capacity of 24 tons. Our motor vehicles meet the highest environmental standards and are kept in a perfect working condition. As standard, each vehicle comes with all the necessary equipment to properly secure cargo during transport (belts, chains, non-slip mats, etc.). All this, combined with an experienced and qualified staff, guarantees the highest level of safety of cargoes entrusted to us. In order to guarantee the maximum safety of cargoes during transport we ensure that they are covered by the carriers liability insurance in amount up to 500 000 Euro. Vehicles in our fleet are under 24 hours a day GPS monitoring and our drivers are staying in constant contact with our freight forwarders. Our experience in the transport and cargo securing services minimises the risk of damages occurring during transport. Necessary licenses and authorisations exclude the risk of stopping the vehicle with the goods by the competent control authorities.